Lawson Bates and Nathan Bates have made it down to Texas and are currently doing rescue work by boat. Please pray for their safety and the safety of those in harm's way. Good for these young men, to go directly to the front lines and do what they can to help those in need! Lord bless Nathan and Lawson as they go out to help. Keep them safe and use them to help others. Thank you Bates family!! Nathan & Lawson are unselfish young men with big hearts. Doing their parents proud!! Seen any Duggars around??? I'm not surprised. Good for them! I wonder if any of the Duggar boys who had Alert training are going down. Haven't even heard Jinger or Jeremy say or do anything and it's now their home state. That's great they are doing this. I wonder if any one will recognize them. I know I would. great job guys. It's wonderful to actually see this family continually practice what they preach :) They set a wonderful example for others. God bless! Oh, goodness that looks dangerous! I hope they stay safe! God bless you guys! Always willing and ready to jump in and help out! Prayers for all. The water level! I love that they're down there to help out and thankful for all those who are able to do so. 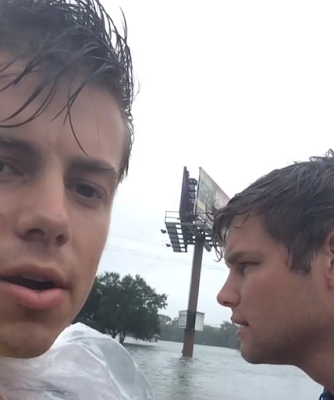 God bless these two young men and all those devestated by this storm. Thank you for helping them. I had family and friends lose their house during this. You guys are definitely in my thoughts and prayers. Thankful Lawson went too and they are doing good for people that desperately need it!!! The Bates' know how to use their celebrity status! Good for them! Yup! Real missions work and now actual hands on help in Texas. God bless you Lawson and Nathan. That's got to be very difficult. it's absolutely ridiculous what these poor people are going through in texas. so glad to see these 2 self-less young men stepping up and helping those in need. great job guys! So proud of Lawson and Nathan-may God bless and keep you both safe. Don't see the Duggar "men" helping with one of their THREE planes. Brave lads, these Bates boys. This is awesome to see. I am in Houston. My house flooded but thank God we got out in time and didn't need to be rescued. We appreciate all your doing. God bless. Why is everyone asking where the Duggar boys are? I think we all need to lay off our expectations of them. Not every family is going down there to help. It's not like they are the only family not going. It would be bad if the only reason the went to help was to look good. Fine young men - Bates family are so eager to help others. I give the entire family KUDOS. Be safe Nathan & Lawson. So proud of the Bates boys! !